If you live in the desert, you’ve probably noticed the sudden burst of color across the hills and roadsides. Not only has the Spring brought an invigorating greenness to the plants of the Sonoran Desert, but thanks to our Winter rainfall, a full rainbow of blooms is now happening across the region. From late February until May expect to encounter desert blooms and a bumper crop of wildflowers, as lovely as they are fleeting. Wildflowers are in season right now, in such density that swaths of the landscape almost appear painted with splashes of purple, yellow and orange and red. Wildflowers tend to cluster together and the specific varieties you will find at a specific site vary with conditions, including sun, shade and altitude. Some of the most concentrated blooms of a single type of flower occur where wind distributes seeds like on the sides of hills and roads. Areas like washes are great for finding wildflowers in variety and abundance. If you want to bask in blooms this year, head for the hills. The nearby Superstition Mountains and specifically Lost Dutchman State Park are going to be a gateway for abundant flora this season. Roadside sights like sprays of poppies, brittlebush and globemallow are a feast for the eyes as they overwhelm the routes through old mountain mining towns. More elusive flowers like the desert aster, desert fairy duster and the sand blazing star might require the more determined efforts of a hike into the regions many, many trails. When hiking in Lost Dutchman, always remember your desert safety. Bring plenty of water along with your camera and protect yourself from sun exposure. Hiking early in the morning lets you view the flowers as many of them begin to unfurl for their daily sun bath and helps you beat the heat. For the adventurous and surefooted, hiking the Picketpost Mountain area offers a wide variety of flora. For those who don’t want to make the steep ascent to the mountain top, A visit to the Boyce Thompson Arboretum can deliver an eye-popping range of unique desert beauty on their easy-to-manage loop trails. You don’t have to trek far from central Phoenix to experience nature, as residents well know. To catch the Spring blooms, a visit to the free and nearby McDowell Sonoran Preserve in Scottsdale can deliver the goods. McDowell this year is bursting with vibrant yellow brittlebush displays – a vibrant, leggy daisy-like flower. You’ll also get a good variety of flowers here and hiking trails span the scope of mild to wild. If it’s your first time at McDowell, try a simple but satisfying route like Lost Dog Wash that will give you plenty of petals to peruse. While the wildflowers are up for the next few weeks, don’t forget to check out the Preserve for some of the season’s later blooms such as the prickly pear, hedgehog and saguaro cactus flowering period. The bountiful rain of the past Winter has ensured that most cacti in the region are ready to put on quite the display when the time is right. A boat won’t help you find the best flowers near Bartlett Lake, but posts have come in this season promising floral bounty in the surrounding hills. Hiking the hills around Bartlett Lake offers gorgeous views of the area, as well as untrampled nature. Heading to the hills here however means being prepared. No set hiking trails makes the Bartlett Lake region an adventure for seasoned hikers, and travelling with a detailed map or GPS device is highly recommended. The reward for the diligent and prepared visitor is access to one of the most breathtaking areas in Arizona’s Sonoran Desert. 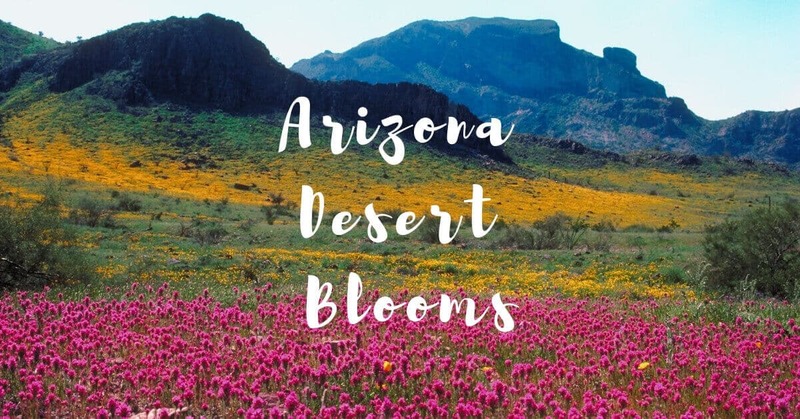 Spring is a great (and busy) time to visit Arizona’s National Parks, with extensive flowering happening across the state. For those more comfortable with something close to home, the Desert Botanical Garden in Phoenix and the Phoenix Sonoran Desert Preserve are an easy way to see some of Spring’s bounty. At CC Sunscreens, we know the sun brings the flowers – but it also rings in their demise as temperatures become too harsh for delicate blooms. Fortunately, you can regulate how you meet the warming months with custom sunshades from CC Sunscreens. We offer custom, durable energy-saving sunscreens that bring comfort and style to your home year-round. Want to learn more? Don’t wait – contact us today!